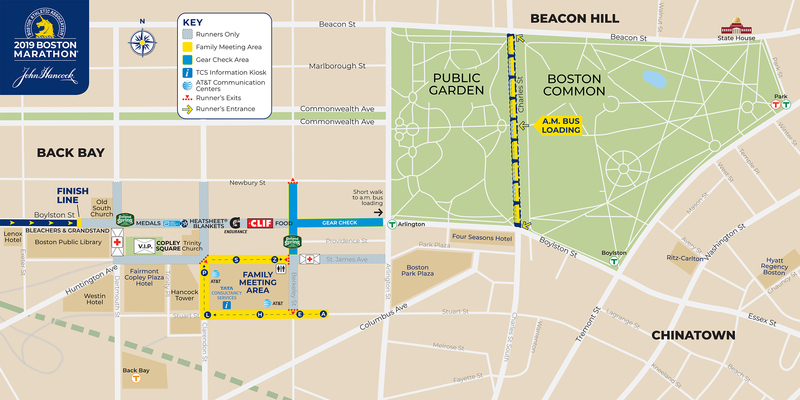 On race morning, participants may check their plastic finish area gear bag at a designated gear check area on Boylston Street. This area is two blocks east of the finish line and one block west of the Boston Public Garden. Signs at the gear check area will be color coded by waves with numbers corresponding to participant bib numbers, indicating where to drop your bag. A pre-approved finish area gear check bag will be included with your race packet at Number Pick-up at the Boston Marathon Expo. The clear drawstring bag measures 18” x 19” with a 5” gusseted bottom is labeled on one side as your finish area gear bag. No other bags will be accepted. Luggage that does not fit within the pre-approved finish area bag will NOT be accepted. In your race packet, you will receive a pre-printed adhesive label with your bib number on it that should be used for gear check. You must affix the label to your approved gear bag before handing it to race personnel. The drawstrings on the bag should be cinched and tied to ensure that your belongings do not fall out. No gear check bags will be allowed on the B.A.A. shuttle buses to Hopkinton. Do not check any valuables. Although we will do our best to ensure that your gear is waiting for you at the end of the race, we are not responsible for lost items and/or gear check bags. There is no gear check in Hopkinton. No gear check bags will be accepted in, or transported from, Hopkinton. Click on the map below to view the Finish Line area, including Gear Check, and Bus Loading Zone. The only bag allowed on B.A.A. buses and in the Athletes’ Village is the one gallon plastic Start Area Bag that is provided to all entrants at Number Pick-up at the Boston Marathon Expo. This Start Area Bag primarily serves to carry food items to the start. Absolutely no bags other than the plastic Start Area Bag will be allowed on buses to the start (exceptions are listed on our Allowable and Prohibited Items page).